The sketch was made by Edward Adrian Wilson (1872-1912), the English polar explorer. He drew the observation on 14 November 1911 in Antarctica, a few months before he died in Scott’s final expedition. The drawing can be found in The Worst Journey in the World (1922), the memoires of Apsley Cherry-Garrard, a survivor of the team. 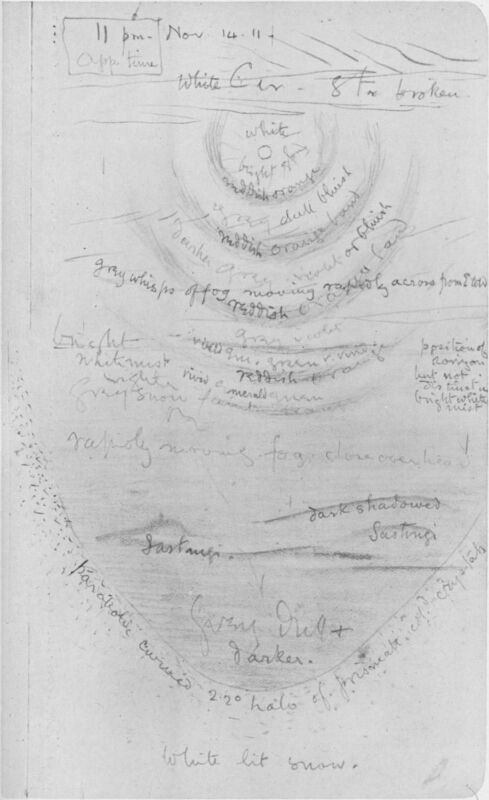 The sketch is not that easy to read, Wilson intended it for later use and re-working. From top to bottom, the notes in the drawing indicate that in the sky, there was white, broken cirrostratus ("white Cir. Str broken"), and the Moon was surrounded by a "bright glory". There were "gray whisps of fog moving rapidly across from E to W". Wilson also marks the "position of horizon" in the middle of the picture, which was covered in "bright white mist". In the lower third of the picture we can read "rapidly moving fog close overhead", and then at the very bottom of the sketch, on the "white lit snow" there is the "parabolic curved 22° halo of prismatic col. crystals", the inside of which is "darker". In the note to Chapter XIV, we can read how the explorers used the snow surface halos for keeping the direction: "It is now that halos may be seen in the snow, almost reaching to your feet as you pull, and moving forward with you: we steered sometimes by keeping these halos at a certain angle to us."